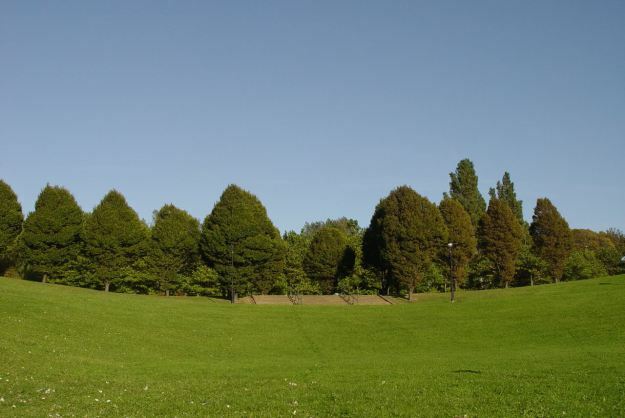 In which I walk the hills of North Liverpool, singing at the top of my voice! 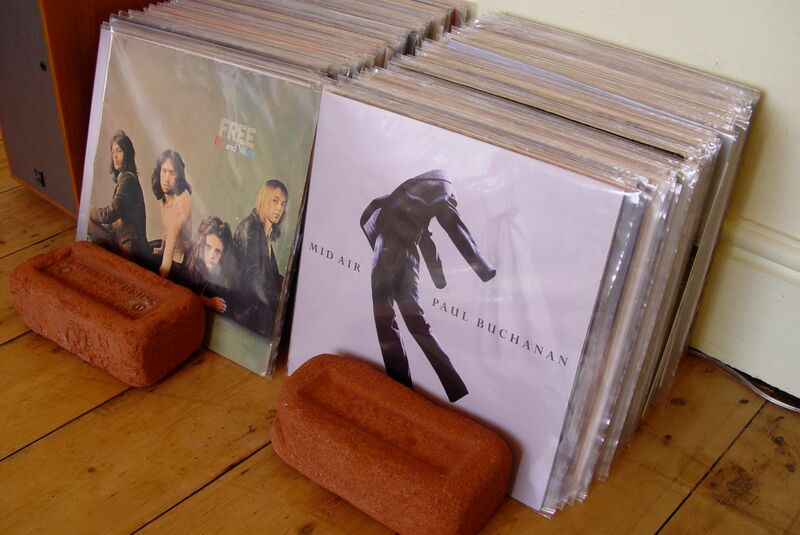 It’s very nearly a year now since I started buying LPs again and it’s going very well, thanks for asking. More new stuff is being put out on vinyl now it looks like it will outlast CDs, and recently our house has been singing out loud to new LPs by local band Bird (swooning keening ethereal good), East Kilbride’s Pearlfishers, Blue Nile’s Paul Buchanan and the sublimely gorgeous ‘Hendra’ by Ben Watt. Nearly a year in, the LPs. But obviously a lot of the records that have come in over the year have been old stuff from charity shops, and it’s one of them I want to write about. £2.99 from Oxfam, as perfect an album as you could possibly get, by Harry Nilsson. Harry had first come to my attention, and everyone else’s in the late 1960s when Beatles publicist Derek Taylor arrived back from the USA with a box of Harry’s first RCA album ‘Pandemonium Shadow Show’. He loved it so much he gave a copy to all of his friends, including our beloved boys, who immediately told the rest of us about Harry. He became a particular favourite of Radio One DJ Kenny Everett, who’d not only lovingly play his records but also record jingles of his own, done in the multi-layered style of Harry, to introduce them. If you’ve got Spotify you can listen to a selection I’ve made of Harry’s songs here. But I want to focus on this one very particular album. 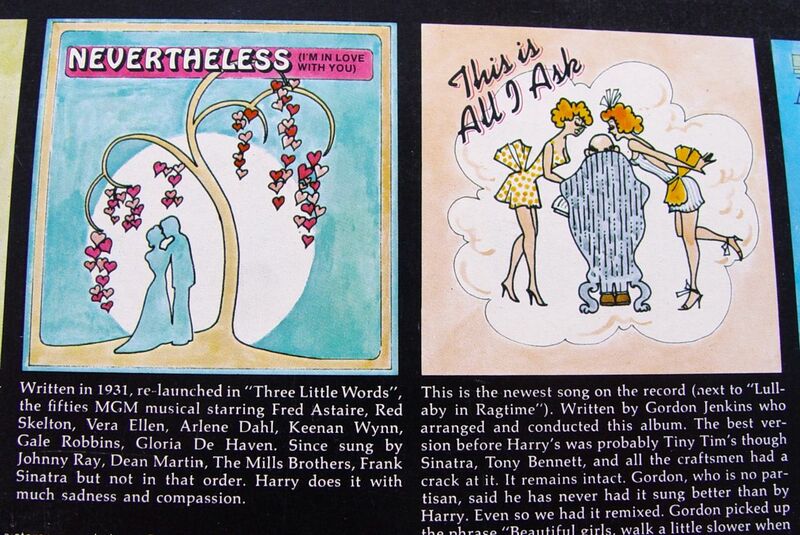 By 1973 Harry had spent years being a well respected cult artist and songwriter. He’d had a big hit in 1969 with Fred Neil’s ‘Everybody’s Talking’ – the theme from ‘Midnight Cowboy’. But mostly he’d crafted away at his own beautiful songs, for more respect than reward. Then in late ’71, early ’72 he suddenly hit very big indeed with one of the most beautifully sung records anyone has ever released. ‘Without You’ is a cover of a song by Apple band Badfinger, but Harry makes the song his own, like the truly great singer he had now become. Which brings us to the album I want to talk about. Harry, being an amiably contrary sort, had followed his world-wide big ballad hit with novelties, profanities and hard rockers. To the bewilderment of much of his new audience. 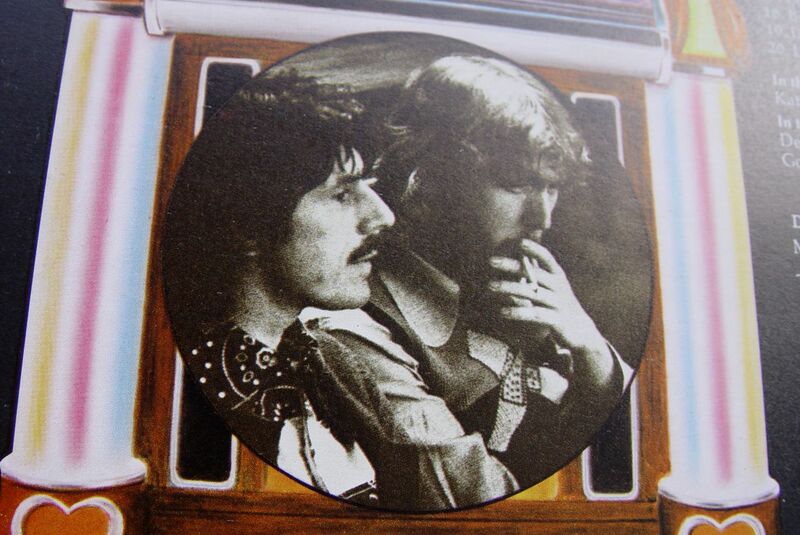 Derek Taylor with Harry Nilsson. So, re-enter that man Derek Taylor, persuading Harry to use his beautiful voice more carefully, on a record of show songs from earlier in the 20th Century. 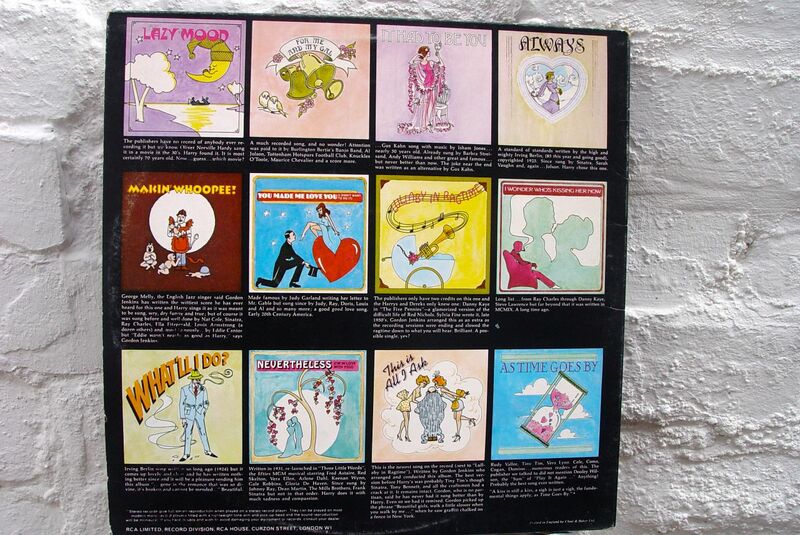 These days knocking out albums of songs from the Great American Songbook has become a bit of a career extending cliché (Rod Stewart seems to be issuing them with the regularity of the old ‘SingAlongaMaxBygraves’ records), but not so in 1973. At this stage we’re not much more than a decade on from Frank Sinatra, Peggy Lee, Nat Cole and the rest making great records of these songs. But mostly we haven’t heard them, we children of the ’60s. So Harry’s LP enters my life like something brand new. I do listen, and I rejoice. 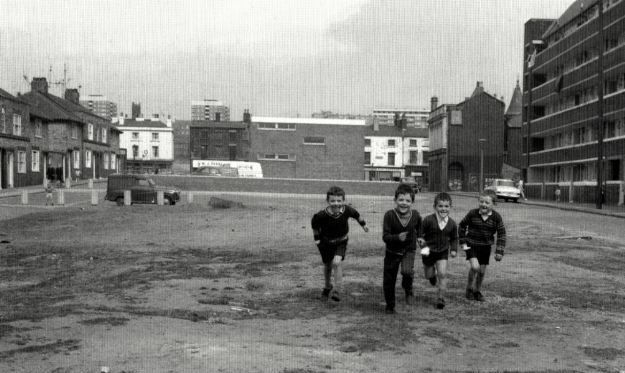 What’s more I walk around the hills of North Liverpool singing the songs! Many years later during a very brief stay in a choir I will be told that my voice is a tenor. Well Harry must have been a tenor too because I find I can sing along with him easily. In fact, if only in my own mind, I think I sound just like him. 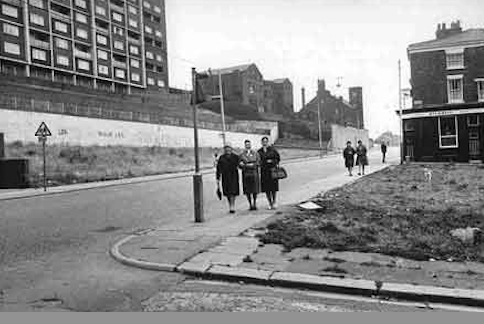 Benledi Street, Scotland Road, early 1970s. In these 1973 days I’m working in my first housing job for Liverpool City Council. Mostly in their rent office in Benledi Street, just off Scotland Road. 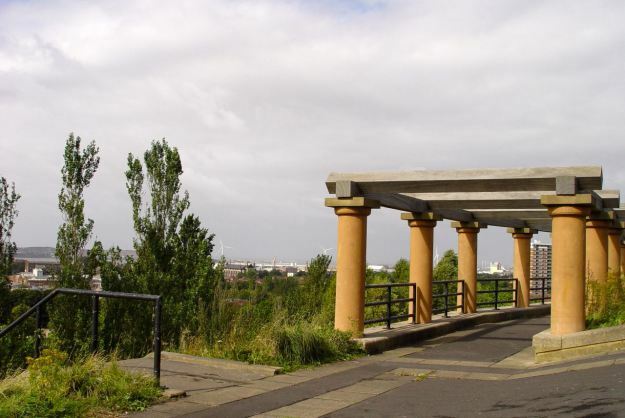 Not, you might have thought, the most welcoming environment for full throated versions of the likes of ‘It had to be you’ and ‘I wonder who’s kissing her now?’ But several times a week I’m sent up to our sub-office up at the top of the hill in Everton, at Netherfield Heights. Netherfield Heights now, what’s left of it, and the view down the hill. And that’s when me and Harry really get space for a proper run out of our glorious songs. We take various routes up the hill. Sometimes up Roscommon Street, sometimes the long way round through the Four Squares (if we want to sing the whole album). Back then. At the top of Roscommon Street, on Netherfield Road. 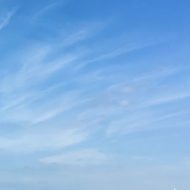 And it’s a sound that still reminds me of radiant happiness. I’m nineteen years old, in my first proper job, and loving it so much I think I might have found my vocation. The area is tough though friendly and is being blitzed by the building of the second Mersey Tunnel. But as I climb that hill with Harry, singing ‘What’ll I do?’ and wondering whether I’ll bother taking up that university place later in the year I remember turning round and gazing at the river feeling like I’ve got the whole world at my feet. Listening to the LP again now brings all of those feelings and memories back to me. Because music can do that. 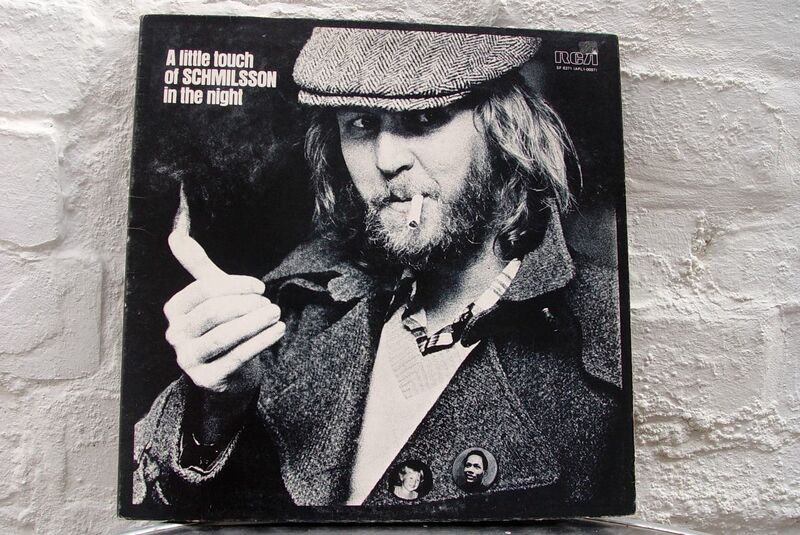 I’ve always had a copy of ‘A little touch of Schmillson in the night’ but during the years when it was a CD I didn’t listen very often. Partly because, as you may know, I never much took to the sound of CDs. And partly because it contained loads of extra tracks. All the songs that appear as intros only, like ghost echoes of themselves on the LP, are there in full on the CD. Making it too long and nowhere near as good. 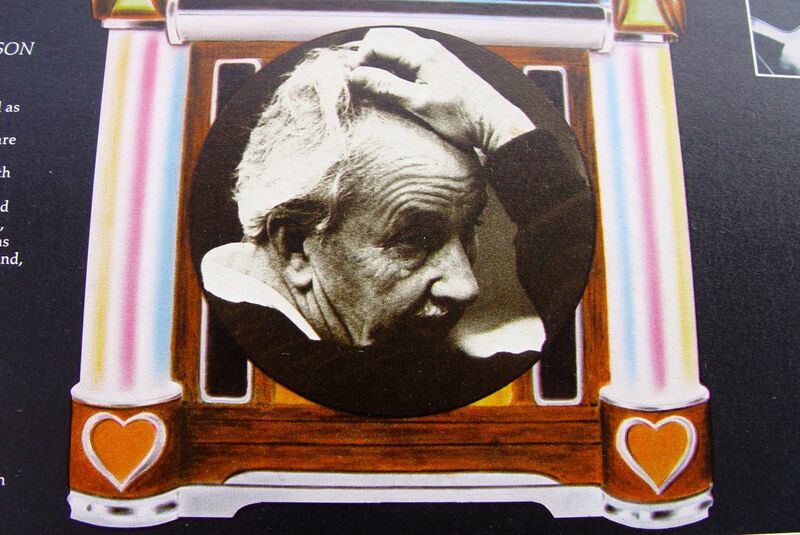 Because the LP is a carefully edited, beautifully sequenced ‘best of’ from the work that Harry Nilsson, Gordon Jenkins and Derek Taylor did together back at the dawning of my adult life. And so I treasure the fact that it’s now back in my life. And it’s an LP. 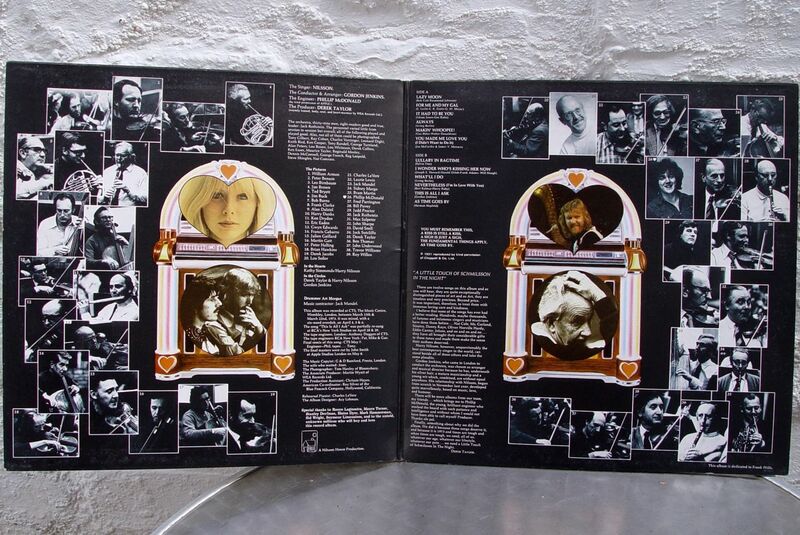 With room on the cover for sleeve notes and photos of everyone who’s on it. And illustrations and little essays about each song. And Gordon Jenkins? Well Derek Taylor’s role as ‘Producer’ on this album is more like a film producer than a ‘turn up the bass’ record producer. So when Derek persuades Harry to make the album, Derek’s the man with the address book and the contacts to pull in everyone they’ll need to make what they want. Not a rock’n’roll version of this collection of songs, but the real thing. So they get Gordon Jenkins to do the arrangements and conduct the orchestra. Gordon Jenkins who’s worked with Frank Sinatra, Louis Armstrong, Nat Cole, Judy Garland and Billie Holiday. The real thing. So they make what remains one of the best LPs I’ve ever heard. Looking back at the facts of the matter now, I’m surprised to see that it wasn’t particularly well received and didn’t sell too well either. But none of that matters. To me it will always be a hit album and the one that opened my ears to a whole style of music that had passed me by until then. Everton now. Where Mazzini and Garibaldi tower blocks once stood. Dedicated, with love and appreciation to Gordon Jenkins (1910-1984), Derek Taylor (1932-1997) and Harry Nilsson (1941-1994). You can watch a BBC performance of the whole thing on YouTube. But obviously I’d recommend finding the LP!